Designed for young boys and girls looking to start exploring trails, parks and dirt lots and for parents introducing their children to the world of mountain biking, the Dynamite is the gateway bike. The Dynamite is a “real bike“ that can grow with kids as they fall in love with riding. The all-new lightweight and durable aluminum frame, easy-to-use coaster brake with additional v-brake option to help little ones adjust to hand braking and aluminum wheels with stainless steel spokes that are durable and don't rust over time make for the perfect kids bike. The all-new lightweight and durable aluminum frame, easy-to-use coaster brake with additional v-brake option to help little ones adjust to hand braking and aluminum wheels with stainless steel spokes that are durable and don't rust over time make for the perfect first bike. Undoubtedly the world's fastest PK Ripper. The ultra-stiff 6066 aluminum frame now comes equipped with new features such as a tapered headtube, PF30 bottom bracket, and 20mm dropouts front and rear. The game has changed. Built with a lightweight 6061 aluminum frame with alloy cranks and a micro-adjust alloy seatpost, the LiL' Ripper weighs in at just 19 lbs. Throw in the Landing Gear forks, Lightning Bolt seat, and Looptail rear end, and it's clear that this is not just the lightest, but also the raddest little bike on the block. The perfect bike to start shredding on. With 3-piece cranks, mid bottom bracket, and all-new, wider 2.3” tires, this bike is ready to get rad. With a 19.5" top tube and a price tag that will get you hyped, the Wildman is the perfect choice for the new BMXer. It's small and light enough to throw around on the ramps, and dirt jumps. And with the 25-9 gearing all-new, wider 2.3" tires, this bike is definitely ready to get wild. 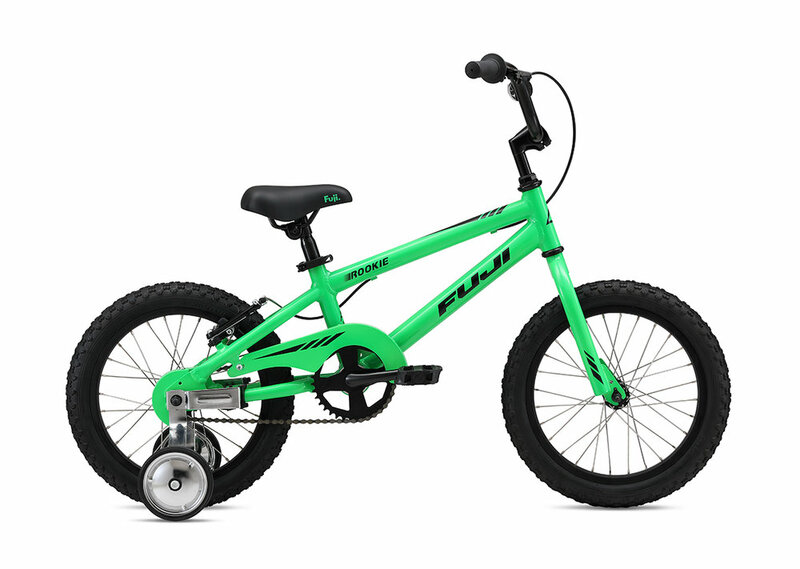 With a short 18" top tube and low standover, the lightweight 6061 aluminum Bronco is a perfect fit for youngsters. Front and rear hand brakes and freewheel rear hub will be sure to build confidence and precision. This is entry-level BMX bike at its finest. Built with a lightweight 6061 aluminum frame, this bike is ready to zip around the playground. The training wheels and coaster brake will build confidence when going out on new adventures. This is the smallest SE bike ever! The 6061 aluminum Bronco 12 comes equipped with training wheels & a coaster brake for the enthusiastic little kid just learning to ride. You’re never too young to have fun a bike. Lightweight, pedal-less design allows children to straddle the bike with both feet on the ground and easily propel the bike by walking or running. Choose from 7 color options! As two bikes in one, the 14x sets a new standard as the best first pedal bike for children 3-7. Quickly attach the included Easy Ride Pedal Kit and watch your child seamlessly transition to riding a pedal bike and accomplish this life-changing milestone! Lightweight, pedal-less design allows children ages 6+ to straddle the bike with both feet on the ground and easily propel the bike by walking or running. Includes front and rear V-brakes. Lightweight, pedal-less design allows children ages 10+ to straddle the bike with both feet on the ground and easily propel the bike by walking or running. Includes front and rear V-brakes. A new and improved frame design with ergonomic footrest! Easy step-in frame, lighter in weight. This model offers air-filled tires for stability and traction. Children everywhere will glow with delight riding the KaZAM Blinki Bike featuring a super strong frame made of space-age clear polycarbonate material that lights up in multi-colored LED lights.